A Book Arts Certificate is awarded upon completion of five core book arts courses offered through the Department of Art and Art History and an additional two courses from the elective list. Alternatively, a student can opt to take six core book arts classes and one elective course. Students can take 3000-level courses in the order that works best for their schedule—there is no prescribed sequence. 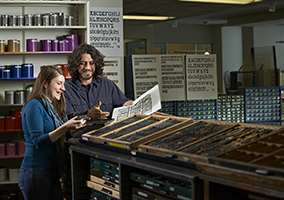 To pursue a Certificate in Book Arts, students must be admitted to The University of Utah as a matriculated or non-matriculated student and have a previous bachelor's degree. Current University of Utah students are also eligible to declare a Certificate. There is no certificate-specific application required once a student has been admitted to The University of Utah. Please direct questions regarding the Certificate to the faculty mentor for Book Arts, Marnie Powers-Torrey: marnie.torrey@utah.edu. To declare a certificate, visit www.finearts.utah.edu and declare online. Also schedule an initial advising appointment with the College of Fine Arts Advisors by emailing advisor@finearts.utah.edu. Only one course may be taken from each course pairing: ART 3060 and BART 3360; ART 3065 and BART 3365; ART 4090 and BART 4390; ART 4095 and BART 4395. Link to Book Arts Certificate in University of Utah General Catalog here. Check out our new 2019 workshops! Click here for complete hours including studio closures and holidays.